The U.S. adult population grew by 6.3% from 2010 to 2016. Growth in the numbers of adults self-identifying as Catholic have not kept pace and are falling into negative territory, according to an analysis of survey data in combination with Census numbers for adults. Since 2010, the adult Catholic population in the United States has declined by 0.9% (equivalent to a net loss of 511,558 adults affiliating). The number of adult Catholics declined from 59.1 million in 2010 to 58.6 million in 2016. The rate of decline has been nearly identical for Hispanic adult Catholics (-0.8%, 176,296 fewer affiliated) and non-Hispanic adult Catholics (-0.9%, 335,262 fewer affiliated). The share of U.S. adults who self-identify as Catholic declined from 25.2% in 2010 to 23.5% in 2016. The share of Hispanic adults who self-identify as Catholic declined from 63.1% in 2010 to 53.8% in 2016. At the same time, there was strong growth in the overall Hispanic adult population of 16.3% between 2010 and 2016. 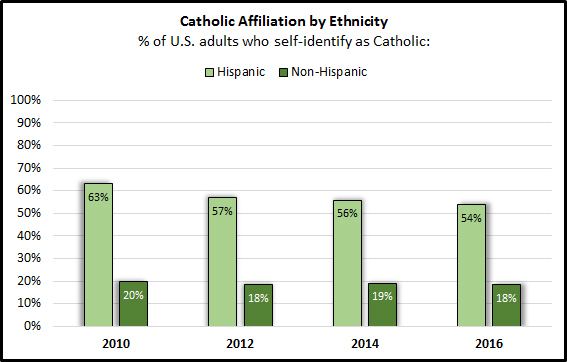 So even with the drop in Catholic affiliation, the share of all adult Catholics who self-identify their ethnicity as Hispanic or Latino did not change from 2010 to 2016 and remains at 35.4%. Population changes have several components. There are births, deaths, and immigration factors to consider. When looking at adult populations specifically because the Census does not ask religion questions and surveys are generally only done with those 18 and older, one must also consider changes in the cohorts entering the adult population over time. Finally, one must account for changes in religious affiliation (i.e., people converting in and switching out). In 2009, the overall fertility rate in the United States was 2.0. This is very near the “replacement rate” of 2.1 where the population is “replacing itself.” Fertility fell with the recession and had not recovered by 2015 when the fertility rate was 1.84. Americans are having fewer and fewer children, even as they report similar numbers of “ideal numbers of children” in the General Social Survey (GSS) as respondents did in the past. What about Catholics? Religion-specific fertility rates are not something that can be calculated by the Census Bureau or CDC with existing data. However, in the GSS we can derive estimates of the number of children Catholic women are having over time. As shown in the figure below, there was a big shift from women born in the 1920s and 1930s (having children in the late 1930s to as the early 1980s) to women born in the 1940s and on. However, a generally shared pattern is evident across cohorts from those born in the 1950s to the 1990s. 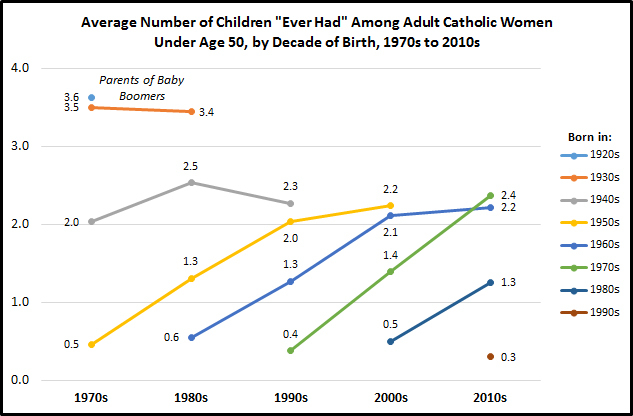 In the data we can see, it appears Catholic women are, on average, having children just above the replacement rate by their 50s. It is far too early to know if this will continue for Catholic women born in the 1980s and 1990s. At the same time, there is nothing in the data now that points to a significant change. The best indicator of the numbers of infants and children entering the Catholic Church is in baptism data (from The Official Catholic Directory or OCD). Here is the first sign of something amiss. The figure below shows the number of new people entering the Church as minors and as adults annually. In 1996, there were 1.15 million new entrants (87% under the age of 18 and 13% age 18 or older). In 2016, these numbers had declined by 28% with 828,702 entering the Church (88% under the age of 18 and 12% age 18 or older). The declines have been similar for both minor and adult entries. This means there are fewer new Catholics entering the faith every year. The light green bars consist mostly of infant baptisms. Thus, most of these entries are not yet adults from 2001 and later. These declines are not yet measured in national polls but will become evident in the coming years. Where they are very evident now is in enrollment numbers at Catholic schools and parish-based religious education programs. In fact, those baptized in 2003 or later are the next Catholic generation coming of age after the Millennials. At CARA, we have chosen to call them the iGen Catholics. They are on track to be a smaller cohort than their Millennial elders. 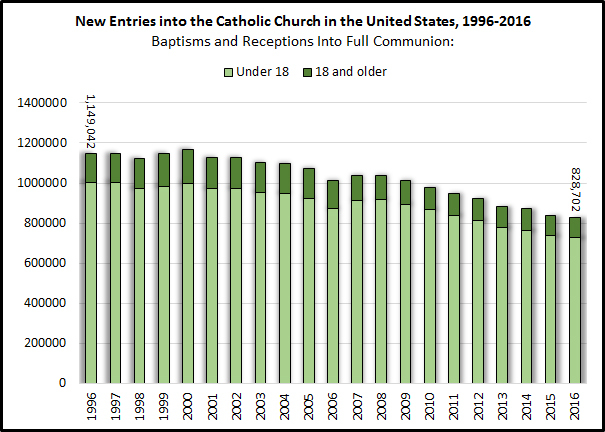 If Catholics are continuing to have children at similar rates as in the past why are baptisms decreasing? Why would a Catholic parent not bring a child to the Church for baptism? Here it might be related to another sacrament—marriage. 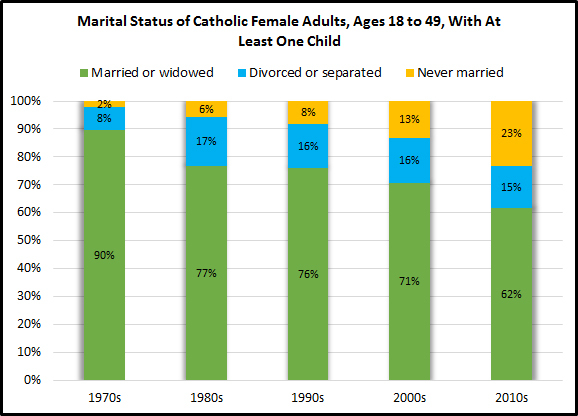 According to the GSS in the 1970s, nine in ten Catholic mothers between the ages of 18 and 49 were married. In the 2010s, only 62% are married. Nearly a quarter have never married. These parents may be reluctant to come to the Church for baptism of a child. In fact, there is one category of baptisms that is increasing in the Church in the United States. These are baptisms of children and teens (i.e., age 1 to 17). Some Catholic parents are perhaps waiting to baptize until they are married? (Note: we have explored alternative hypothesis). With marriage there is another potential complication. While the number of Catholics marrying had been in a bit of decline since the mid-1990s, this began to change in 2011 as the economy came out of recession, as shown in the figure below (estimates are made using government data on marriages, surveys, and the number of Catholic marriages reported in the OCD). At the same time, now more than ever, these marriages often do not occur in the Catholic Church. In 1970, three in four Catholics who were getting married got married in the Church (426,309 marriages out of an estimated 565,124 Catholics marrying in this year). This fell below 50% for the first time in 1982 when 347,445 Catholics married in the Church. Yet, as recently as 1996, half of Catholics marrying were still getting married in the Church. After 1996, a slow decline began and by 2016 only 144,148 unions were celebrated in Catholic parishes (29% of all Catholics marrying in this year). Thus, even among Catholic parents who are married and have had their first child, there may be some hesitancy to bring that child to the Church for baptism if they had not married in the Church. If they had children before marrying (…or were simply living together at the same address) they may also be hesitant to seek marriage in the Church. It is also important to note that marriage in the Church has an important “rebound” effect on adult entries. The most common reason given by adults converting to Catholicism for switching their religion is that they are marrying a Catholic. Fewer marriages in the Church between Catholics and non-Catholics will result in fewer adult entries into the faith. In 2015, 23% of marriages in the Church were between a Catholic and non-Catholic spouse. 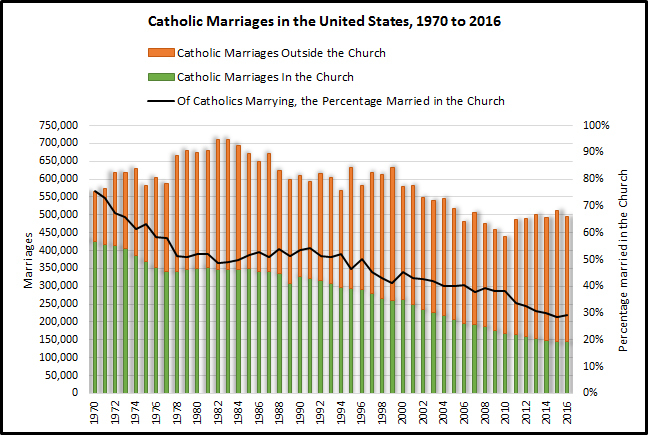 In 1996, 31% of marriages in the Church were between Catholics and non-Catholics and there were more marriages celebrated overall. Even with the declines in total annual entries, more than 700,000 new Catholics under 18 added to the population every year is still a significant sum. But how many of them stay Catholic? This is another issue of concern when thinking about population changes. According to the GSS, prior to 1994, about eight in ten or more adults raised Catholic remained Catholic as adults (i.e., when surveyed). This “retention rate” fell into the 70%-79% range through 2008. Since that time, about two-thirds of adults raised Catholic remain Catholic now (there are even higher retention rates among adult entrants. Also it is important to note that some Catholics who leave return later as “reverts”). 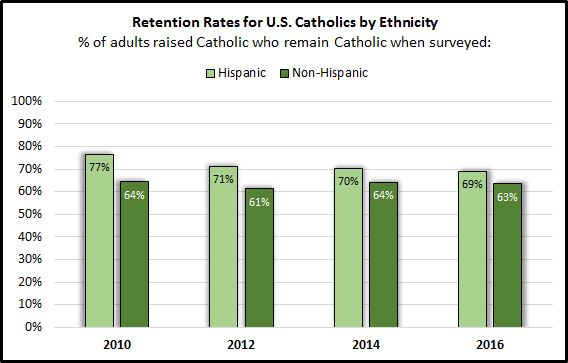 The figure below shows recent changes in retention rates among Hispanic and non-Hispanic Catholics. What is notable here is a drop in retention rates among Hispanics raised Catholic from 77% in 2010 to 69% in 2016. This drop in retention has resulted in a decline in the affiliation rate for Hispanics. As previously noted, in 2010, 63% of Hispanic adults in the U.S. self-identified as Catholic. Only 54% did so in 2016. Retention and affiliation rates among non-Hispanic Catholics have remained stable in the short-term. Declining affiliation among Hispanic Catholics should be of great concern to the Church because a majority of Catholics under the age of 18, those of the iGen, are Hispanic. To put these changes into a bigger context we can look at what changes occur over time among U.S. adults by ancestry to a particular country (as reported in the GSS). 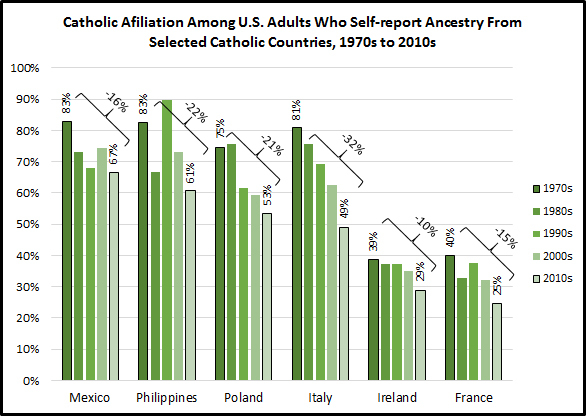 As shown in the figure below, descendants of people who immigrated from countries where Catholicism is widespread often show diminishing affiliation over time. Coming from a very Catholic country to one with abundant religious pluralism and religious freedoms is a dramatic cultural change. It should not be surprising that religious switching out of Catholicism occurs across generations. I often think of this as a “regression toward the mean.” That mean in the United States is about a quarter of the population who self-identifies as Catholic. If this is the case, we might expect Hispanic Catholic affiliation rates to continue to fall in the coming years. It is also the case Hispanic affiliation rates are dependent on where Hispanic immigration is coming from. In the United States, majorities of self-identified Mexicans, Dominicans, and Salvadorans self-identify their religion as Catholic. However, minorities of Cubans, Guatemalans, and Nicaraguans say they are Catholic. Another factor to consider is mortality. Assuming that Catholics are not more or less likely to die than others in the United States we can use Gallup’s Catholic affiliation percentage along with government data on deaths to estimate the number of Catholics who die each year. This can be subtracted from new entrants. Here the Catholic Church has long been in positive territory and remains so today. There are more new Catholics entering the faith each year than those who pass away. Yet the margins are tightening. In 1996, there were an estimated 578,750 Catholic deaths. By comparison, 1.15 million entered the faith in this year. That’s a net difference of more than 570,000. Parish reported funerals for 1996 indicate that about 80% of Catholics who passed away in that year received a Church funeral and/or burial. In 2015, there were an estimated 640,076 Catholic deaths. Nearly 870,494 new entrants joined the faith in this year for a net gain of 215,044. Also notable, only 63% of Catholics who died in this year likely received a Church funeral and/or burial. Just as with baptisms and marriages, we have a bit of a mystery. Why are fewer Catholics coming to the Church to bury their elders who have passed away? The last factor to consider, which is difficult to estimate, is immigration. But we do know that 39% of foreign born adults in the United States self-identified their religion as Catholic in 2016 compared to 50% in 2006. That is a big shift. In addition to Hispanic Catholic retention rates and affiliation rates falling it also the case that some foreign-born Hispanic Catholics who used to reside in the United States have left. In some cases, the numbers moving out are larger than those coming into the United States (see: More Mexicans Leaving Than Coming to the U.S.). In the end, a net Catholic population loss of -0.9% or -511,558 adults between 2010 and 2016 is a relatively minor event. At the same time, there seem to be a lot of moving parts to the shifts in the Catholic population going on underneath this change. Understanding the decline in new entrants is essential. This is a dynamic that is happening at the level of the family where it meets the parish community. Something is disconnected. Trends in retention rates are also troubling. The median age young Catholics are leaving the faith is 13 with about half joining another religion and the other half having no affiliation.